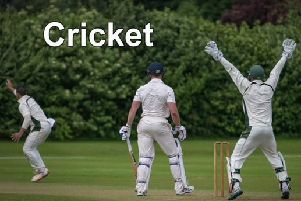 Entertaining Owmby in a Lincoln & District Leage Division Two game on Sunday, Horncastle Cricket Club Firsts raced to an emphatic nine wicket victory. Owmby batted first and set their hosts a target of 146, bowled out in 33 overs. Jeremy Stanton (37 not out) and Will Cawte (31) top scored, while Nathan Whiting and Richard Hickling eached picked up two wickets for Horncastle. With opener Rob Bee leading the charge, Horncastle made short work of their target, reaching 147 for the loss of only one wicket in just 16.4 overs. Bee was the only wicket to all, but his 73 ensured there was only ever going to be one outcome. His opening partner Jonathan Clark was unbeaten on 32. The win strengthened Horncastle’s postion at the top of the table, where they are 39 points clear of second placed Hykeham, although Hykeham have a game in hand. But Saturday’s Lincolnshire County League Fourth Division game at home to Keelby did not go the way of Horncastle, with the visitors running out easy 10-wicket victors. The home bowlers were given a small total to defend after Horncastle, batting first, were dismissed for 107 in 31.5 overs. Ony William Broughton (23) and Lewis Lovegrove (22) managed to get passed the 20 mark as Bruce Roberts dominated the batsmen, taking 4 for 28 off 8 overs. Andrew Fisher (37 not out) and Matthew Brockman (52 not out) made short work of the run chase, taking the score to 110 in 22.3 overs to secure the win.